Michal Golan is an Israeli born, New York City based, painter, printer, and jewelry designer. In her New York studio Michal creates hand crafted jewelry pieces which combine the look of the antique with contemporary fashion sensibility. Her unusual style, technique and meticulous attention to details distinguish these ornately jeweled designs. 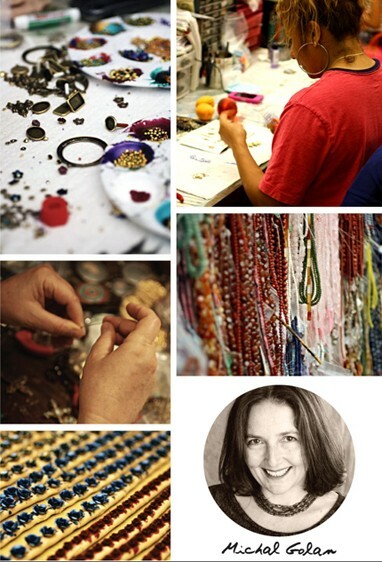 Michal's designs are inspired by Byzantine and Victorian jewelry with its generous use of gemstones and pearls. Another source of inspiration is Middle Eastern art, particularly Mosaic styles, apparent in her lavish decoration of surfaces and use of brilliant colors.